We left home at 8:00 AM. Did a triple ride on Gour’s bike and went to Kolar amma temple. Its again built by the Chola’s and has excellent art works. 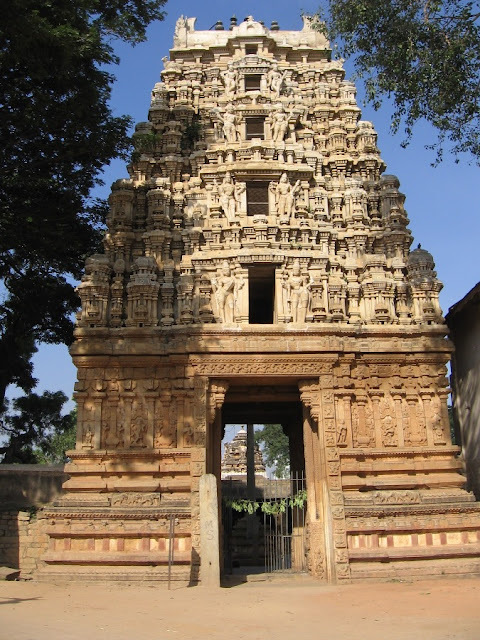 Just next to this temple is another temple called Someshwara temple which houses a magnificent entrance and a beautiful temple with a kalyana mantapa (Wedding dais) Someshwara temple in Kolar city is one temple that is a “must see” I would say. From here left to Antar Ganga, also referred to as Dakhsina Kashi. A natural spring on top of the hill is the main attraction here. Our ancestors were so brilliant I thought, they identified such pure forms of water and built a temple around and named it sacred so that people did not miss use it but the so called modern Generation like us, who are more confused about our own cultural heritage have failed to recognize these criticalities. People were washing clothes, taking shower and even collecting this water and selling them down at the city. 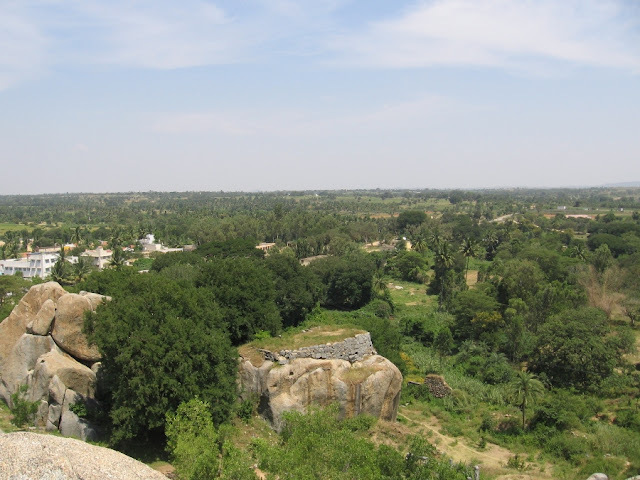 I wanted to take a picture of the entire Kolar city and for which I had to climb a little more higher since from where I stood, I could only see Nilgiri trees. I asked an old man for a right spot from where I could get a glimpse of the entire city. He pointed me towards a path which when followed took me to top of a rock from where I got an amazing view of the Kolar city. The first picture in post one is the result of this desire. On the way to the top, we met a villager. He said that there was a village on top of the hill. I was surprised how they traveled daily? He happily answered – We have bus facility since last two years. What before that? I asked. He said they used to walk. They have farms and grow their own vegetables. I wanted to visit the village but it was too far and we did not have time to fit in this unexpected plan. So we returned back to the bus stand. Thanked Gour and said good bye to him. We took a bus to Bangarpet. In the bus I be-friend a passenger and collected all the information about places that we have missed in this trip. In my mind I planned another trip to Kolar to cover them. He guided us to the bus we had to take to reach Budikote. 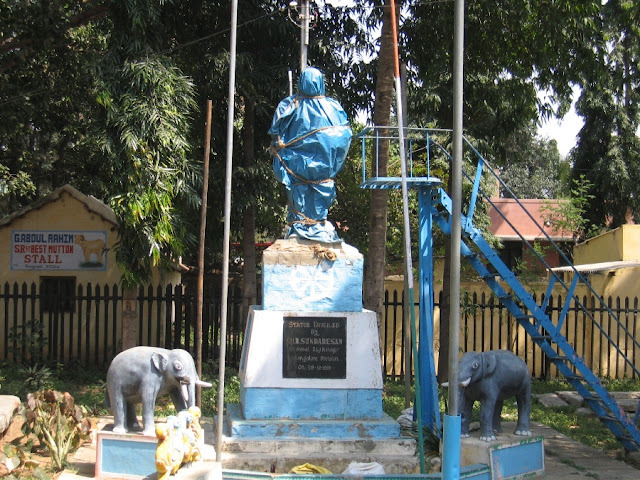 Budikote is a village about 7 Kms from Bangarpet. It has a fort and is supposed to be the birth place of Hyder Ali. The fort was hauntingly empty, of course there is nothing much left of the fort now. After a while we spotted two kids who had bunked their special classes and where spending time there. I requested them to take us to the top of a huge rock inside the fort. They were glad to do so and guided us to the top. From this height one could get a beautiful sight of the village and wide spread fields. After thanking the boys we left to the bus stand where a few villagers suggested we go to the dam which was about 2 Kms away. Some were surprised to see me carry bag, they asked me whether I was from some school and was carrying books? We stopped by a bakery. The owner was helpful in giving us some details about the dam and the buses. He has an oven of his own and thus bakes puffs and bread himself. We tasted some fresh puffs. We left to Bangarpet in the very next bus. Unable to find any good hotel we tried to enquire with localities. A gentleman looked at us in surprise for a while and said – “See, Bangarpet as far as I know is very bad when it comes to food, you will not find any good hotels here.” And he was right; we could not spot a single descent hotel in the main city. We finally bought some buns and biscuits and went to the railway station. We booked the tickets to Bangalore. During our wait, an old lady sat next to me and started talking. She talked non-stop for almost half an hour till the train arrived. Last time she had boarded a wrong train which had carried her to some alien land, and then she had to return all the way back. She said she can’t read as her parents did not educate her and she was married at a very early age. She told me several events from her life and I listened to her. When she heard my story of visiting temples she quickly said – Now, after visiting so many temples you need to go home directly and see your mother; isn’t it?” I was touched by her words. She might not have undergone formal education but she has the knowledge that no school can teach. There are some lessons that only our elders can teach us and that is why probably since our childhood we have been asked to respect elders. During these journeys through remote places of my country, I am realizing more and more the importance of our culture , our tradition and I have realized one thing that our ancestors were great, they have created every rule, every thought, every ritual with a motive that we so called younger & so called modern generation fail to understand and instead enjoy questioning them. Well this topic will be an entire post on its own to follow soon. The train journey back to Bangalore was uneventful, except that we did not get a seat through out the trip. This trip to Kolar has opened my eyes towards several emotions of our people. Through out the trip it was people and only people who have guided us, helped us and advised us with as much enthusiasm as was in us. I salute the villagers of our country for their innocence, their unbiased attitude, their respect for tradition and culture and their kindness and rawness which I hope shall never fade. You deserve a smile after that kind of a climax! It's true there are so many places India that are so rich in history, culture and heritage, and yet unknown to us. Thank you for sharing the essence of Kolar. Good job. I wonder if it's allowed to visit the Gold Fields there? Not allowed to enter the Gold fields as the mines have been shut down now...after some strike few years back. Yes I have visited Belur and Halebid 3 times and never seem to feel tired of the place....It’s simply the best ever. One can spend hours together studying those sculptors. I assume you have been there, how did you like it? awesome.. once again.. guess, u can actually publish a book out f this!!! Thanks BJ..>Seems like you are not getting enough time off your Studies for some travel? I haven't read your posts on Kolar yet, but the pics are fabulous, as always. i feel like talking to u non-stop half an hour too. Oh yeah, Kolar temples are world famous. Awesome pictures. Never been there but your post inspires me to do that. @Backpakker - Thanks. Yes it is great fun to explore villages and small towns. I havent been through your entire blog, but it appears to be a lot of information for me though for fututre trips. Do you have any backpacking memories of Singapore? @Cuckoo - Oh is it, But it had absolutely no visitors there except for us. And I think this is due to lack of proper transportation facilities. Of course I've been to Belur & Halebid, and twice already. 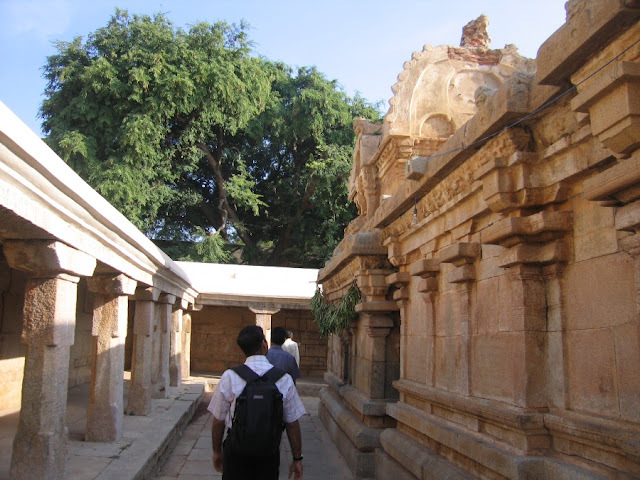 The temple architecture must be better than the ones at Kolar, right? Ajeya, I have travelled quite a lot (within India and outside) but haven't blogged about those trips. Even if I start someday, might take a few years to cover it all. While in Belur, there was some puja going on there and I have some pictures. Will post sometime. 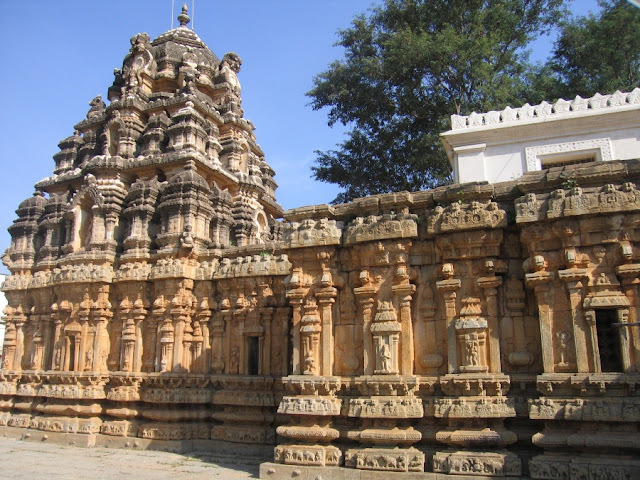 Halebid is more impressive with its amazingly intricate and ornate Hoysala architecture. I hope it will be accepted as a World Heritage Site. I agree with you, one can never tire of admiring the beauty of those two temples. Oh Ok, Yes the work at Bellur and Halebid are truely uncomaprable. I would love to see the pictures of the puja. Do post them sometime. Belur and Halebidu makes me sad at times, Its disheartening to see the demolished sculptures. Which other countries have you visited. I am planning a backpacking to Singapore sometime...have you been there? I feel sad too that the marvellous Halebidu temple is in a state of neglect and that not enough attention has been given to it. About my travels, where shall I start? I've been to about 16 countries and 17 states of India. Haven't been to Singapore, though have reached Thailand and Cambodia. Yes ..I do have ..been to singapore a couple of times.. good, you asked, will post them..do you need any specific info? @Indicaspecies - Good, You have traveled a lot. Will wait for more posts from you. I am on vacation and may not be able to use much of internet so will catch up when i am back next week.